“The Attorney General has been discharged from MedStar Washington Hospital Center. He was taken there earlier today as a precaution, after experiencing lightheadedness and shortness of breath during a senior staff meeting at the Justice Department in Washington. “The Attorney General arrived at the hospital at approximately 10:30 am, and was treated for an elevated heart rate. He received medication that quickly restored his heart rate to a normal level, and after successfully completing a full range of tests, doctors were satisfied that the Attorney General could be discharged. “He departed the hospital at 1:15 pm. He walked out without any assistance, and has returned home, where he is resting comfortably. U.S. Attorney General Eric Holder has a stressful job, and perhaps the stress peeked its head on Thursday. 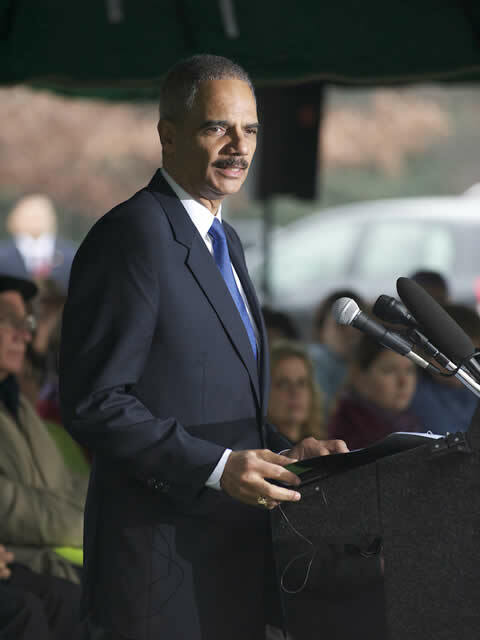 The Justice Department reported that as a precaution after feeling faint and being short of breath Thursday during a morning staff meeting, Holder was taken MedStar Washington Hospital Center by ambulance. He appears to be doing fine. He will remain in the hospital for testing, the station reported. Posted: 2/27/14 at 2:19 PM under News Story.